Jackie Wilson earned the nickname “Mr Excitement” for his performances as one of the most dynamic and electrifying soul singers of the ‘50s and ‘60s, with an extraordinary four-octave vocal range and an ability to deliver up-tempo rockers and dramatic semi-operatic ballads with equal credibility and panache. He made his first solo records in 1953 under the name Sonny Wilson for Dizzy Gillespie’s Dee Gee label, before joining Billy Ward & The Dominoes as a replacement for Clyde McPhatter, when the latter went solo. Wilson, in turn, embarked on a solo career in 1956 for the Brunswick label, scoring a landmark hit with his first release “Reet Petite”, and going on to chalk up fifty hits before suffering a disabling heart attack in 1975, which ended his career, with thirty of those hits coming during the years covered by this collection. 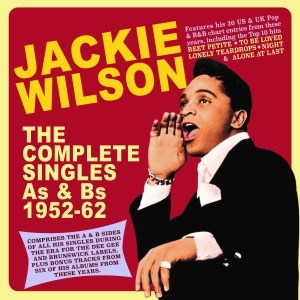 Great-value 55-track 2-CD set comprising the A & B sides of all his singles during the era for the Dee Gee and Brunswick labels, which as well as “Reet Petite” features the Top 10 hits “To Be Loved”, “Lonely Teardrops”, “Night” & “Alone At Last” along with his other chart entries from the era. Also included are bonus tracks from six of his albums released during from these years. It’s a worthy showcase for a unique talent.